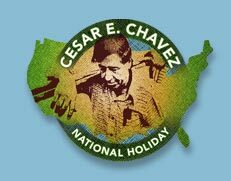 Cesar E. Chavez National Holiday is a Los Angeles based organization dedicated to winning a national holiday in honor of Cesar Chavez. The organization is closely allied to the Communist Party USA. Cesar E. Chavez National Holiday was established by Los Angeles volunteers who organized and led the effort in California that won Cesar Chavez Day, the first legal state holiday and day of service and learning in honor of farm worker leader Cesar Chavez. The legal holiday bill introduced by then State Senator Richard Polanco (Los Angeles-D) was signed into law by then Governor Gray Davis (D) on August 18, 2000. The holiday is celebrated in California on Cesar E. Chavez’s birthday March 31st. This marked the first time that a labor leader or Latino has been honored with a public legal holiday. The mission of Cesar E. Chavez National Holiday, a public benefit organization, is to work for national recognition of Cesar E. Chavez on his birthday March 31. We are forming national, state and local coalitions; organizing volunteer committees; and providing education about the value to our nation of honoring Cesar E. Chavez,. The Party could do much more with agricultural workers, again there is the objective impediment of our small size, which of course can not be overcome without active mass work. Tactically, we can be more open as communists with these workers and their organizations than might be prudent with other unions, especially at the onset. Thanks to the outstanding, historic work of comrades in California winning the Cesar Chavez Holiday, we have a special edge in working with agricultural workers unions. The Party should organize a southern tour by Comrade Evelina Alarcon to promote the Chavez holiday; comrades should initiate work to build a movement to win a national holiday. Such a project is an avenue for comrades outside the unions to establish working relations with union labor in general and farm labor and the Spanish-speaking community in general. This page was last modified on 5 January 2016, at 04:35.